...and it feels weird to not be racing. A while back I decided to take a year off from 24 hour solo racing and now I have mixed emotions about it. However, I will definitely be up there to cheer for my friends and support them any way I can. Good luck everyone! Up next is the Park City Point to Point on September 5th. The Victor Bike Park opened on the weekend of July 20th and that was my first ever experience riding in a bike park. Before the big build weekend, I was excited about the pump track and looking forward to honing my cornering skillz and learning to generate my own speed. However, I did not expect to get hooked by the dirt jumps. But then Fitzy let me take his new Norco Two50 dirt jumper for a couple of laps...and I didn't want to give it back to him. Despite the fact that I could only clear one out of three table-tops on the smallest jump line, I was having a blast. I tried jumping on my Turner Sultan, clipped in and lycra clad, but it just wasn't the same. The low center of gravity, wide bars, compact frame, and overall burliness of a true dirt jump bike has a specific purpose...to launch you into outer space and then let you land safely. I had to have one. After all, I helped bring this park to fruition and I plan on spending a lot of time there in the future so I might as well have the right bike. I had a small breakthrough last night at the bike park. I finally landed all three trannies on the small jump line...repeatedly. What a cool feeling! For those who have never dirt jumped, landing cleanly on the transition generates speed and sets you up to clear the next jump. If you come up short of the transition and land on the table-top instead, all speed is lost. Tonight I am back to training and will attend the Tuesday Night World Championships in Jackson where I plan to launch to several Kamikaze attacks that will surely fail spectacularly. Ha! I was just as excited to see Michelle come out of her two-year race retirement as I was to actually race the Pierre's Hole 100 as a team. Michelle took all of last summer off from racing and went into this summer with no definite plans to race but I was able to convince her to race with me at Pierre's. Once she got it in her brain that she was coming out of retirement she quickly got focused. The team format at Pierre's is pretty loose...you can mix up your laps any way you like so we decided that Michelle would lead us off and do the start lap plus the first full lap and then I would do the next three laps in a row. At the end of the day, I know Michelle wished that she would have done two full laps but she had fun and didn't absolutely destroy herself so it was a huge success. Plus, now she is hungry for the Park City Point to Point Race September 5th! We are both signed up for the whole enchilada...no team racin' in Park City. Having the Pikers stay with us the night before and hang out with us all day at the race was an added bonus. Mike won the 35+ Men's race with a ridunculous-ly fast time and Meagan was incredibly supportive all day. I also learned a saying from Mike: When you are about to do an event that is sure to hurt, it is important to "Feng Shui your pain cave". Greatness! I didn't take this race for granted but I don't think I was quite ready for the pain of Lap #3. I was definitely cooked when I crossed the line and if I had to go out for another lap it would not have been pretty. Oh yeah, did I mention it snowed? Actually, graupel fell on me for most of my climb up Dry Creek on my second lap and at the time I was thankful it was not rain. At least graupel bounces off and doesn't leave you soaking wet. Let me say again, this race is going to grow! Stay tuned for the 2010 Pierre's Hole 50/100 race date. Wow, what a weekend. Michelle and I raced the Pierre's Hole 100-Mile as a team and finished in 10:56:00. The only other 100-mile team was made up of local fast-guys Ben & Aaron. The course was every bit as hard as we thought it would be, and then some, and the weather was just nasty enough to make it interesting but not impossible. Photo credit to Mac McCoy. Thanks to Mac & Nancy for volunteering at the Dry Creek Aid Station for a while and cheering us on! Obviously this pic was taken on my first of three laps, Ha! Congrats to all of my homies for strong races. Since Michelle led off our team effort I got to see the start and cheer everyone on as they came through after the "Start Lap". Lastly, Andy Williams of Grand Targhee and Troy Barry deserve a huge congrats too. They put on an excellent race and I know this one will grow into something big. I am saying it now...next year there will be 200 racers at the Pierre's Hole 50/100. I think I finally tracked down the mysterious creak in my Air 9 that has been haunting me since the Cream Puff. I am 95% sure it was my Time Atac pedals! Man, I can't stand riding a noisy bike. EDIT 8/17/09: The friggin' creak is back already after racing Pierre's Hole! Michelle and I are racing the Pierre's Hole 50/100 this weekend as a team. Woohoo! I am psyched to see Michelle get the racing bug again. Targhee sits at 8,000' and can be a weather magnet so this could be interesting given the wet forecast. Did you pack your climbin' legs? 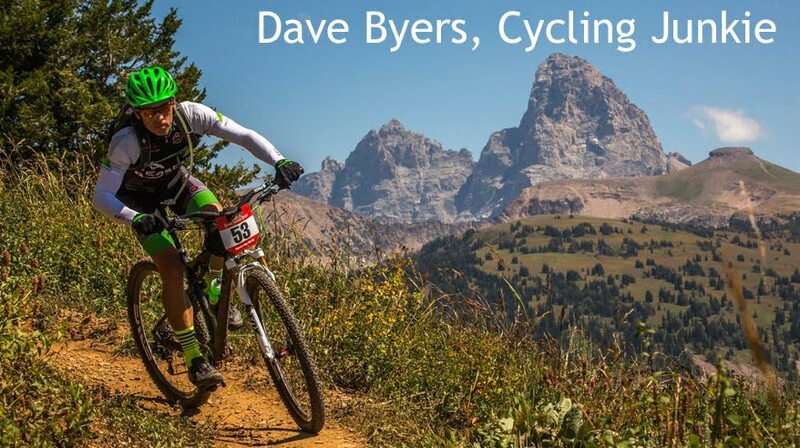 Moving the start to Targhee means that the Bustle Creek climb comes late in the lap. Ouch. We attempted a pre-ride of the entire course yesterday but heavy rain on Saturday left the Rick's Basin singletrack too wet to ride so we skipped the first 5-6 miles of the loop. I am still not sure how long a lap will take me at endurance race pace but I think it will be more than 2.5 hours. There is about 3,900' of climbing per 25-mile lap. Since I was wide awake earlier than planned this morning, I decided to be productive and headed up to a section of the upcoming Pierre's Hole 50/100 Race to see if I could buff it out a bit. The climb following the Bustle Creek descent is on the lush, Dry Creek double track. The climb is 100% rideable but will definitely hurt after a couple of laps. I am really looking forward to this one. The course has a little of everything to throw at you and lets you strategize where to burn your matches. Choose wisely. The saying “It is not how you start, it is how you finish”, exemplified my 2009 Laramie Enduro. I am not sure why my legs felt heavy and my head was filled with negative thoughts so early in the race this year because I know I prepared well and had a good week leading up to this race. In a race this long, almost everyone has a low moment or two but typically those moments come well into the race after the body is starting to break down. When I had no zip on the early hills and couldn’t hold the wheels in a few early pace lines I let it get me down and therefore the first 4 ½ hours of my 2009 Laramie Enduro were all about damage control. It is a damn good thing I am stubborn. Since I wasn’t blessed with a freaky VO2 max, at least I have that going for me. Ha! About an hour into the race I was grinding along one of the gravel road sections, alone and into a headwind, and I heard a familiar voice behind me. It was JayP and T-Race on the Love Shack and they were on me in half a second. They started with the Sport group several minutes behind the Open race and had already caught me. As they came by I tried to jump on their wheel but I only managed to hold on for about three pedal strokes before getting spit out the back like I was dragging an anchor. They were absolutely flying and it was impressive to see. When I rolled into Aid #2 I was not exactly snappy and positive but I was ahead of my previous best split to that point…barely. My brain was having a hard time with the fact that I was “pinned” but seemingly going in slow motion. The section between Aid #2 and Aid #4 contains most of the infamous water crossings in the Enduro. I am not even sure you can call them water crossings. They are more like pits of stagnant black goo surrounded by wet grass and have a unique, not so pleasant, smell to them. This year’s wet spring & summer in Laramie meant that the bogs were knee-to-thigh deep and required hoisting the bike up above the waist to make it across. I learned the hard way a few years ago to never, ever, ever try to ride through one of these bogs. The black bogs are just one of the many unique features that give this race its unique character. The approach to Aid #4 is a long, very gradual climb on double track and this year it was into the wind. I would have to say that this was my low point because I “felt” so slow and I didn’t know what my previous split was to this point in the race but I was convinced that I was behind my goal. In the past, I have felt great rolling into Aid #4 and enjoyed the big crowd that gathers there to cheer us on. Let me say again, the volunteers at the Laramie Enduro aid stations are incredible. I stopped at Aid #4 and handed two very dirty bottles off to get filled while I slugged down half a bottle of water & eight Endurolytes in an effort to prevent cramping. When I left Aid #4 I didn’t consciously decide to “turn it around” but a combination of small victories helped me do just that. There are some steep climbs after Aid #4 and despite “feeling” slow I was catching up to a few folks. With every pass of a fellow racer my mental state improved and when I got to the singletrack I was riding pretty well. Cleaning the rock drops that I typically walk here gave me even more juice and I was gradually getting my mojo back. The infamous Headquarters Climb comes after Aid #5 and can either be; A) a glorious way to finish your race or; B) a mental beat-down that you will have to live with until the next time. I consciously chose option A. I attacked that climb one rock ledge at a time and with each rider I passed I gained momentum. The evil part about the finish of this race is that you are not done once you crest the Headquarters Climb. There are still a few miles of rocks and roots to go before you get spit back out onto the road to the finish line. As I was pedaling as hard I could through the rock gardens near the end I remember telling myself “you can go just as fast on a hardtail, it just hurts a little more”. In the personal victory category, the last hour of this year’s Enduro ranks up there at the top for me. My personal goal for this race was 6:29:59 and I finished in 6:25:00 despite not having my best legs. This race will always be a personal favorite for its overall vibe, the great support, the great post-race scene, and the challenge. At the top of my race notes it will say, “don’t take this race for granted, it is no gimmee”. Congrats to all of my teammates who had very solid races! Woohoo! Finished the Laramie Enduro in a new PR of 6:25:00 today. There were definitely highs and lows for me and oddly, the lows came before the highs. More once I get back to Victor. The whole posse from Jackson/Teton Valley has solid races. Nice work gang!